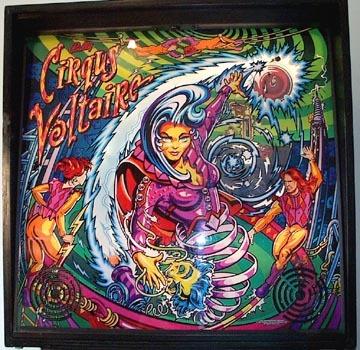 This is my latest indulgence, a Cirqus Voltaire game by Bally. I have wanted this game for quite some time, and was presented with the opportunity to acquire a premium specimen, so I had to go for it. 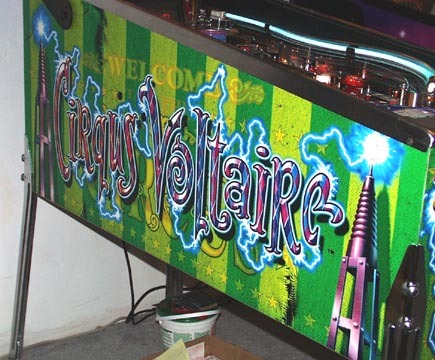 Check out the pictures at the Action Pinball site, this is the place I bought the machine from, and they have some pretty good pictures, as well as decent descriptions.. This was acquired on October 1, 2001. The circus theme is carried throughout the game, and your objectives are all associated to the circus: A Highwire act, Jugglers, Acrobats, Wild animal tamers, along with various Sideshow oddities. 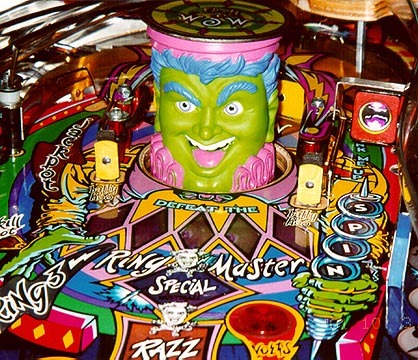 These are all overseen by The Ringmaster, in the form of a large head, with green skin and blue hair that rises up out of the playfield and taunts you! 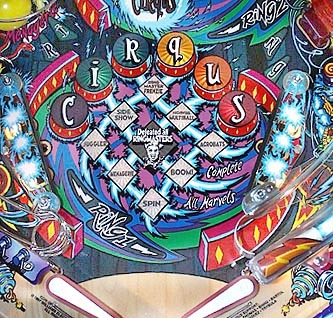 This game features a couple of 'disappearing' targets, one is the Ringmaster, and also the game has a retractable pop bumper ('BOOM' balloon), to make things more interesting. 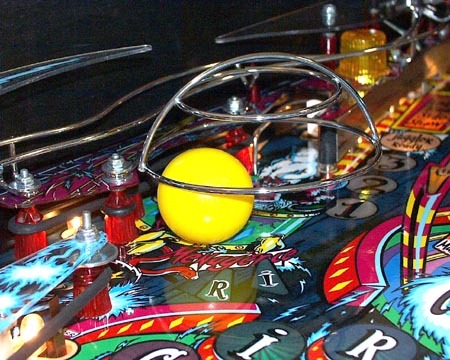 This game has EIGHT multiball modes, and has an impressive number of objectives to shoot for during game play.. This is also the only game produced that moved the Dot Matrix Display down to the playfield level. It has a lot of neat animations that the player can see and appreciate without diverting his eyes too far from the playfield action. the display was moved to playfield level, for better integration with game play. at certain times during the game. So it's not just a pretty picture! 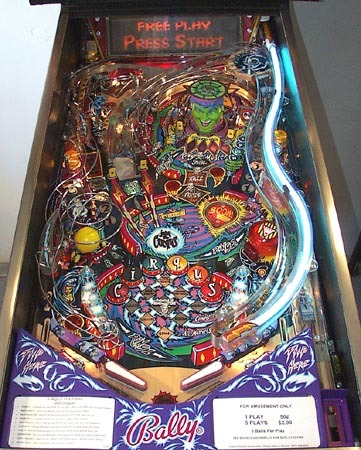 certain mode, that's the only thing lighting the playfield! This is the Ringmaster. This is the main 'toy' on the playfield. center marvel on the marvel grid. A couple of detail shots. On the left is the Menagerie Ball and Cage. This is where the animals are tamed. Shooting the ball around the captive yellow ball to hit necessary targets can be quite a challenge! 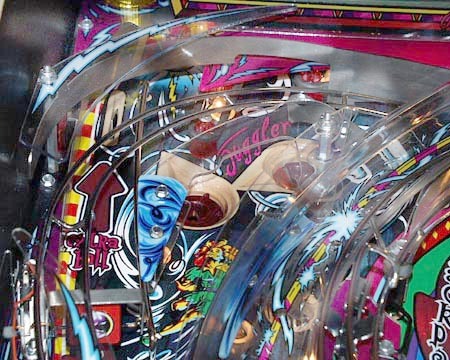 The right image shows the Juggler area, which is in the upper-left corner of the playfield. Here is the grid, which shows which 'marvels' you have achieved during the game. If you can achieve all nine marvels, thus lighting the letters 'CIRQUS', you have a chance to Join the Cirqus which is a multi-level mode that requires quite a bit of skill (and luck). Just achieving all nine marvels is tricky! Here's a full-length shot of the machine. Fits nicely with my High Roller Casino. And finally, the cabinet. I'll have to also include a shot of the side of the backbox eventually.. It's a very cool looking machine (IMHO)! 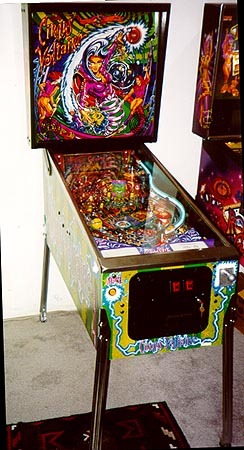 For more pictures of this specific machine, go the the Action Pinball website. This is where I bought the machine, and he has a lot of good pictures and very complete descriptions here.